It’s approaching evening, and the sun slips behind the forested hills of Oregon’s Siskiyou Range. As dusk gathers, the air starts to chill. But you don’t mind. 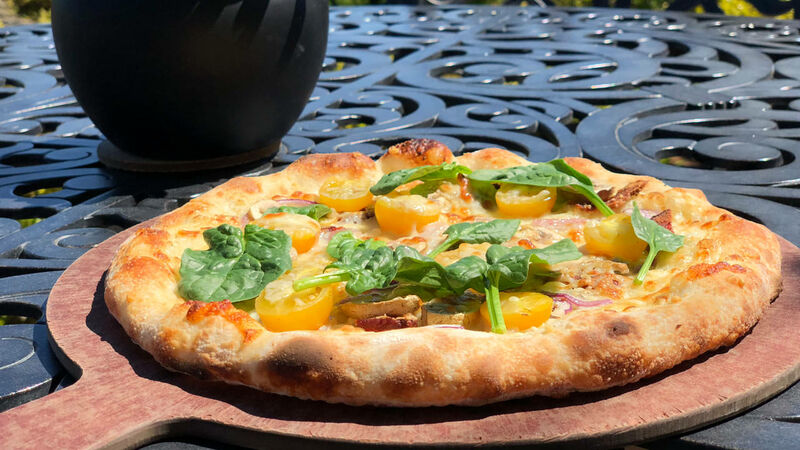 You’re nestled in a corner of DANCIN Vineyard’s heated piazza sharing a bottle of silky 2017 Adagio Southern Oregon pinot noir with two of your closest friends — and a steaming wood-fired pizza, topped with veggies grown mere minutes away, isn’t far behind. Here’s how you can experience all that this acclaimed Rogue Valley estate has to offer. DANCIN prduces dozens of wine varietals from grapes grown on their estate and throughout the region, including 15 blends of pinot noir. 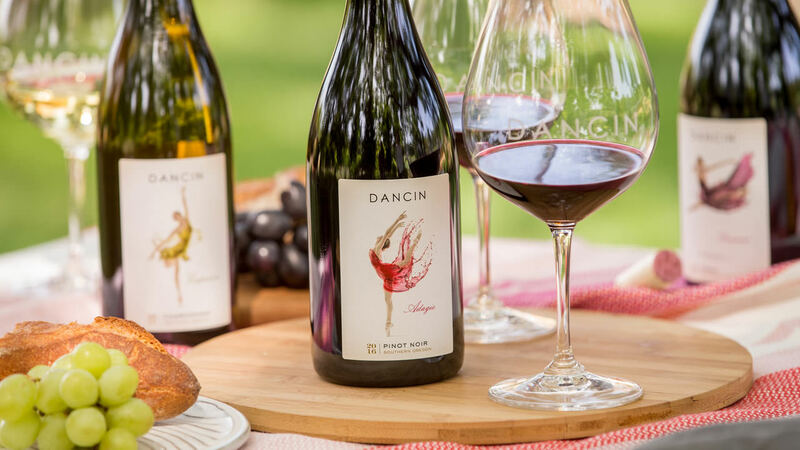 Taking advantage of that versatility, family-owned DANCIN Vineyards produces seven wine varietals, including up to 15 blends or single-clone bottlings of pinot noir and nine chardonnays each year, from a combination of estate-grown and fruit grown throughout western Oregon. Syrah, barbera, sangiovese, zinfandel, and port round out the varietal portfolio. A natural winemaking approach, including the use of native yeast, keeps the focus on the fruit and makes DANCIN a terrific place to experience the different terroir of Oregon wines. 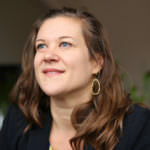 “Most of our tastings are done tableside,” Marca explains. “This provides each guest with the opportunity to taste at their own pace while discovering the distinct expressions of pinot noir and chardonnay, as well as the other varietals we produce.” All of DANCIN’s wines are named after movements in ballet, underscoring that elegant, minimalist approach in the cellar. Nibble on wood-fired pizza and other Sicilian-inspired bites at the cozy fire bar, outdoor patio or heated piazza. Much like ballet dancers themselves, DANCIN’s wines delight as soloists, but truly shine in a pas de deux with the farm-to-table food served onsite. Since the winery was founded in 2012, food has always been part of the DANCIN Vineyards mission, especially given Dan’s cultural background. “I grew up in an Italian family, and delicious food made from locally sourced ingredients was the centerpiece of our gatherings. We conveyed our love through food. And for my grandmother, eating anything less than three full helpings meant you didn’t love her enough,” Marca laughs. 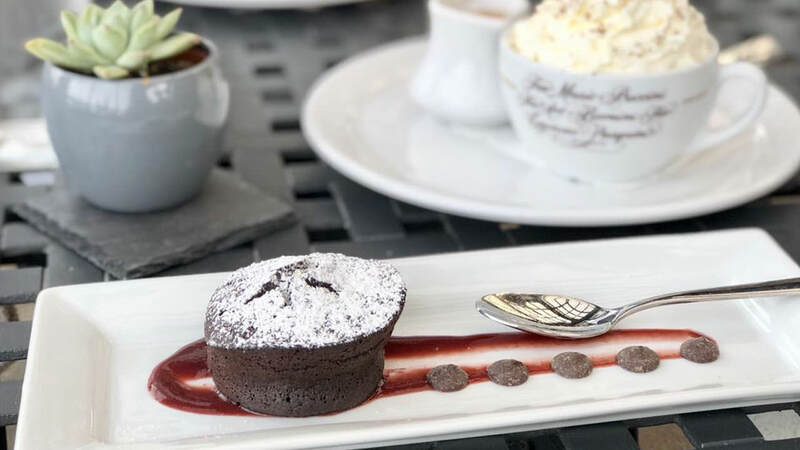 After a family trip to his father’s hometown decades ago, Marca fell under the spell of the Sicilian way of eating, drinking, and enjoying quality time with friends and family. This is the inspiration for the tasting room and the relaxed ambiance at DANCIN, where wine and food can dance together. 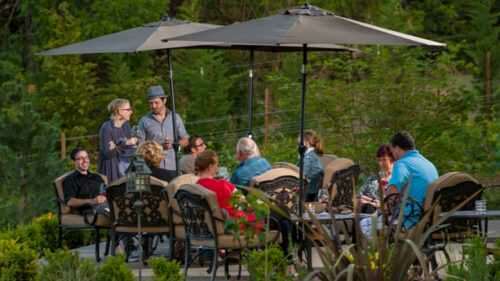 At DANCIN Vineyards, that translates to an expansive locally focused food program delivered with an emphasis on heartfelt hospitality. Unlike other tasting rooms, where visitors may perch at a counter, guests can truly relax in comfort here with seated wine tastings in seven different areas, including a cozy fire bar, an outdoor patio, or a heated piazza that pays homage to the community gathering places of Europe. Guests may order from their paired food menu in each space. It's easy to unwind, relax and spoil yourself with DANCIN's focus on comfort and hospitality. Fittingly, the classic cuisine of Italy influenced DANCIN’s menu. Mushrooms stuffed with cheese and Italian sausage (a local favorite) makes a great pairing with DANCIN’s 2016 Septette Southern Oregon pinot noir. An antipasto board featuring local formaggio and salumi is outstanding with a fresh, citrusy white like the 2017 En Croix Southern Oregon chardonnay. A selection of wood-fired pizzas highlight a rotating cast of regional toppings on a house-made dough infused with olive oil makes a craveable companion for the full-bodied 2016 Tribute Southern Oregon Barbera. Find their menu — which is updated every six weeks — and more information about pairings on DANCIN’s culinary page. Plan your visit around a live event, such as music, yoga, winemaker dinner or choreographed ballet performance inspired by DANCIN's wines. 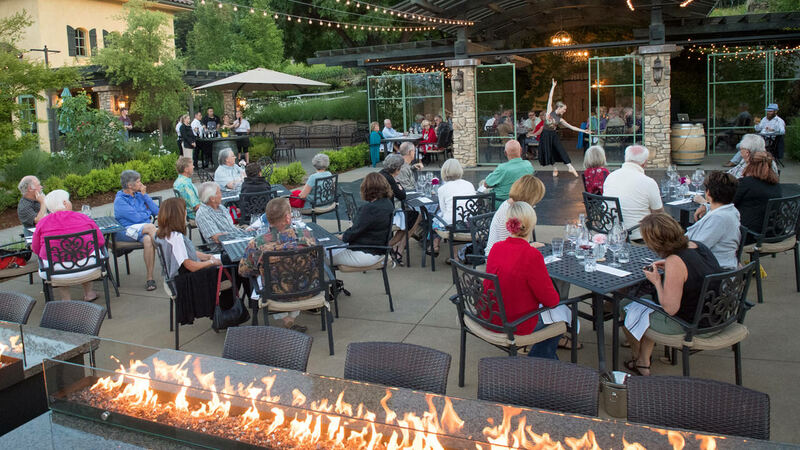 Plan your visit around one of DANCIN’s special events, including live music, yoga classes, holiday meals, salmon bakes and an annual winemaker dinner where five to seven courses are accompanied by not only wine, but by specially choreographed ballet dance performances inspired by the wines themselves. 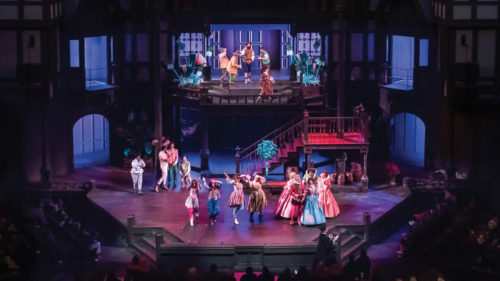 While you’re visiting, nearby attractions include the outdoor Britt Pavilion in historic Jacksonville (don’t miss summer’s Britt Music Festival), and the world-famous Oregon Shakespeare Festival in Ashland. Fish or raft the nearby Rogue River, or enjoy one of Southern Oregon’s many hiking or mountain bicycling trails. 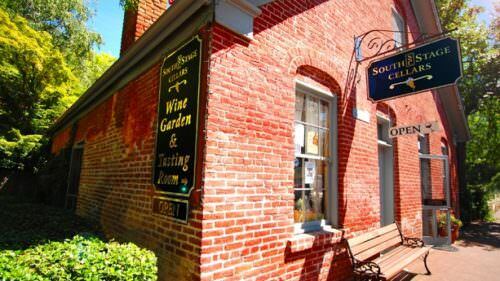 Elan Guest Suites or the Jacksonville Inn, both in Jacksonville, offer boutique lodging experiences a few minutes’ drive from the winery.